The ‘Aboriginal Voices’ project is a consortium of researchers invested in seeking long-term solutions to the many and varied issues that have been identified as factors contributing to the underachievement of Indigenous students in education across Australia. The Aboriginal Voices systematic review project established an agreed methodology and protocols in order to map ten reviews to an overarching question: ‘What are the issues affecting the underachievement of Indigenous students in Australia and how can research inform solutions to the complex and inter-related issues needing to be addressed?’ The Project focuses on bringing clarity to the overarching question by applying a rigorous process with an Indigenous methodology to undertake these unique reviews. This introductory paper outlines the development of a critical Indigenous methodology used in these discrete but inter-linked systematic investigations. 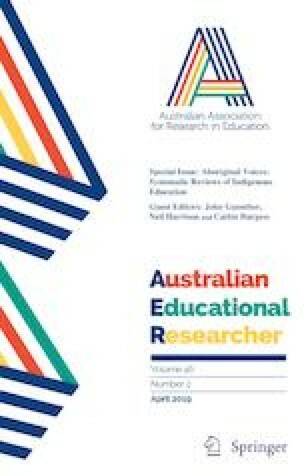 Using a consistent systematic methodology facilitated the re-aggregation of separate review findings to achieve new whole-of-systems insights into the complex issues affecting the educational opportunities of Aboriginal and Torres Strait Islander students. The original version of this article was revised: The author “Cathie Burgess” has been included in the author group. A correction to this article is available online at https://doi.org/10.1007/s13384-019-00323-5.